Muscle Milk® Ready-to-Drink is a protein-enhanced functional beverage that promotes exercise recovery, lean muscle growth, and healthy, sustained energy. Muscle Milk takes the guesswork out of high performance nutrition, delivering a precise blend of premium proteins, complex carbohydrates, functional fats, vitamins & minerals. No matter what your goals may be - building lean body mass, toning your physique, or weight control, Muscle Milk Ready-to-Drink is the perfect and complete protein-enhanced functional beverage for your nutritional needs! Premium Proteins: Muscle Milk Ready-to-Drink contains a precise mix of complex proteins for sustained energy including, Calcium and Sodium Caseinate, Milk Protein Isolate, and Whey. Functional Fats: Predigested, trans-fat free Medium-Chain Triglycerides (MCTs) are more likely metabolized for muscle energy and heat than stored as fat. Long-Chain polyunsaturated and monounsaturated fatty acids from Sunflower/Safflower and Canola Oils are also less likely to be stored as fat. Lactose Free: Muscle Milk Ready-to-Drink contains ZERO Lactose! 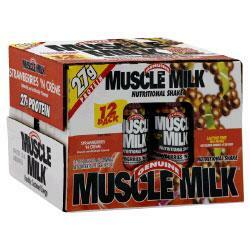 Buy MUSCLE MILK READY – TO – DRINK SHAKE Now!